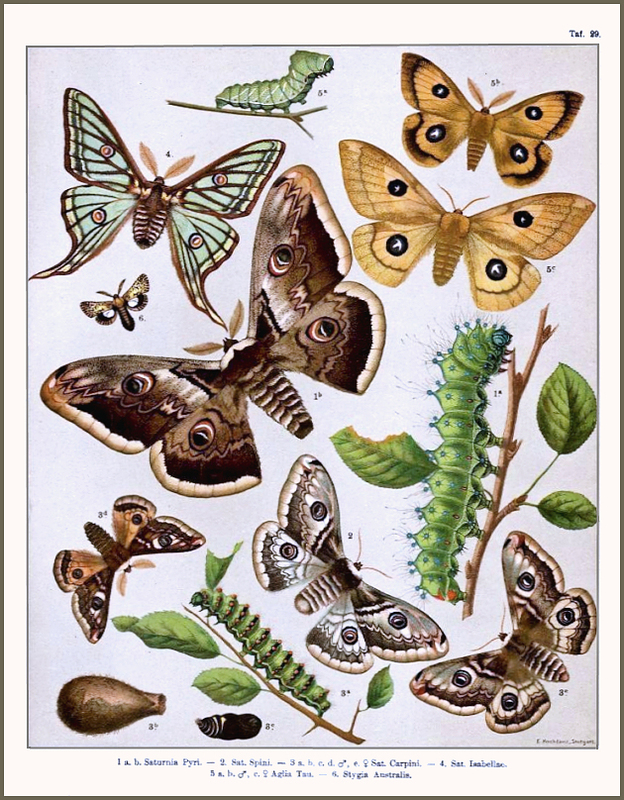 Phalaena pavonia Linnaeus, 1778, Syst. Nat. (Edn 10) 1: 496.
carpini [Denis & Schiffermüller], 1775.
iberligurica Gómez Bustillo et al, 1982. Holarctic; Palaearctic (both eastern and western). Pleistocene refuge: Polycentric -- Iranian, Mediterranean and Caspian refugia. Wingspan (males) 40--65mm, (females) 48--90mm. 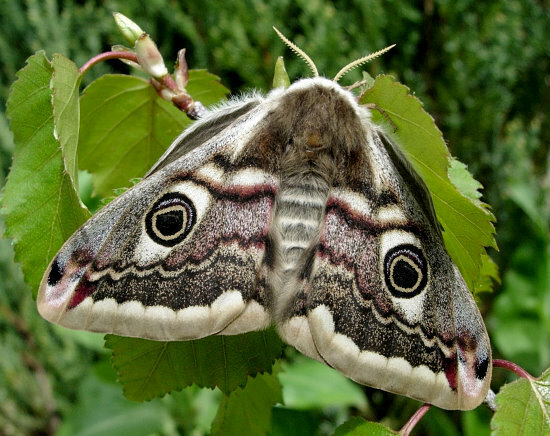 A small version of Saturnia pyri, but differing in being sexually dimorphic and much greyer, and lacking any of the chocolate-brown of that species. 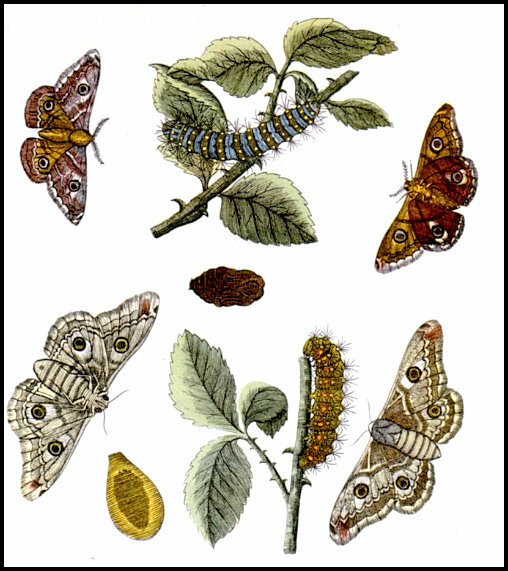 The sexes are similarly marked, but males are more brightly coloured, with rosy, tawny and orange hues. 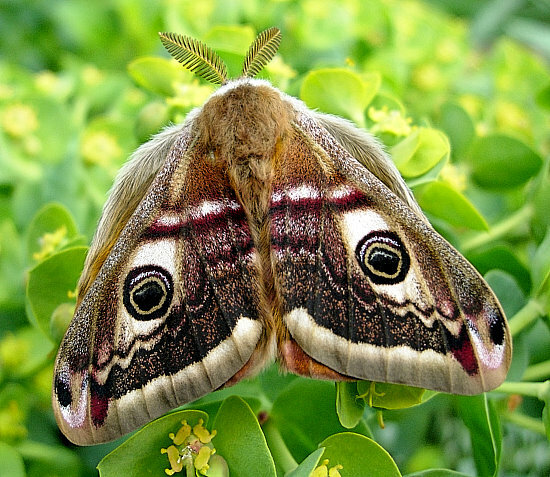 There is little variation, but sometimes the eye-spots are missing from all wings (ab. obsoleta Tutt), or abnormally shaped. Occasionally, a female may be coloured as per the male, or be very dark grey. Although the females are nocturnal, they call by day, often attracting many of the diurnal males on sunny afternoons. 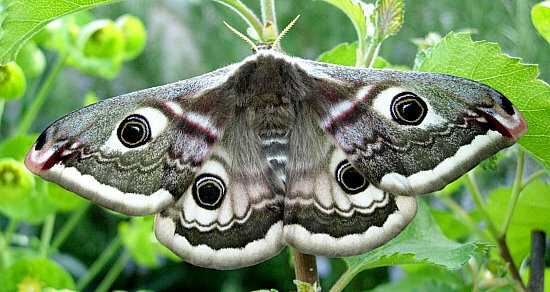 These dash madly here and there over open ground in search of the females; however, females of this species only pair once, unlike those of Saturnia pavoniella. This is a very adaptable species of shrub-strewn grasslands, heaths, woodland margins and hedgerows, occurring up to 2000m altitude in the Alps. Depending on latitude and altitude, March to June as a single generation. In the UK, most are on the wing from mid April to May. OVUM: Oval, 1.4 x 2.2mm, greyish-white with olive-brown gum. 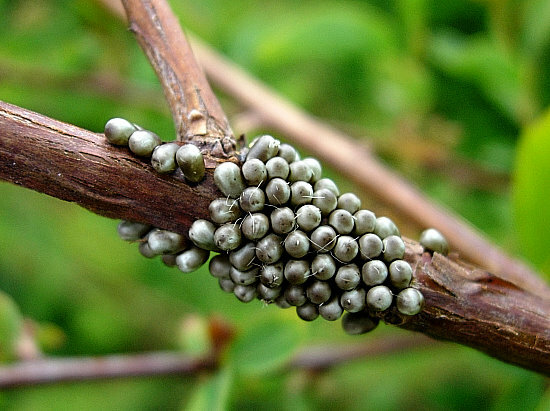 Laid in neat clusters around peripheral twigs of the host, hatching ten to fourteen days later. 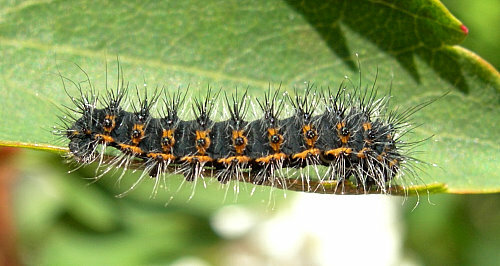 LARVA: Full-fed 60--75mm. The newly-hatched, 2--3mm-long larvae consume part of their eggshells before clustering together. At this stage they are black and bristly, with some orange down each side. As they grow, patches of orange appear around the base of the tubercles. These spread and coalesce with further growth, and gradually become green. 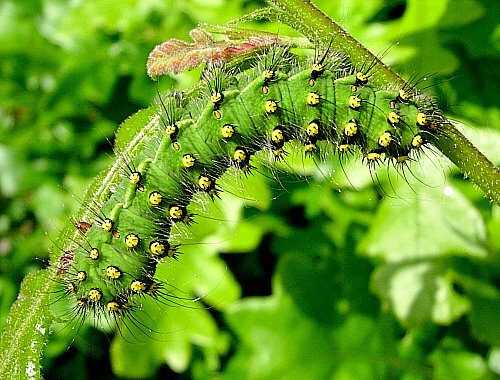 Most full-grown larva are grass-green with a yellow sub-spiracular line on the abdominal segments. Each segment bears dorsally a half-ring of six yellow, pink or orange, spine-topped tubercles. These may have a black ring around their base which, in some individuals, link up to form a black band. 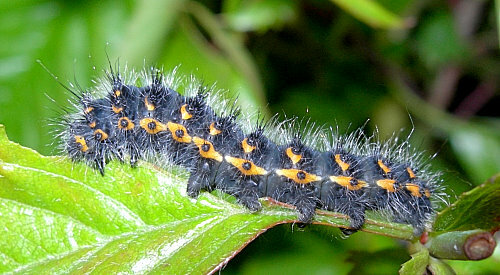 Some larvae may be completely black, and many have varying degrees of black pigmentation. 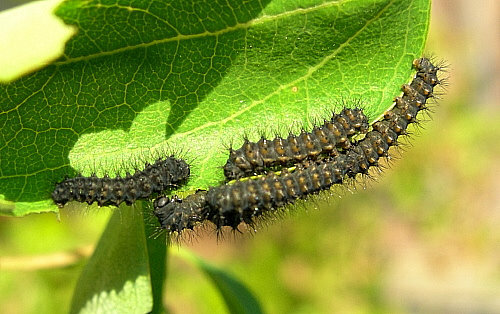 Young larvae cluster together and move about quite openly; however, as from the second instar they disperse and become solitary. Hostplants. Polyphagous, with different plants being preferred in different areas. Favourites are species of bramble/raspberry (Rubus), Prunus (Prunus spinosa), hawthorn (Crataegus), oak (Quercus), hornbeam (Carpinus), birch (Betula), willow (Salix), heath (Erica), blueberry (Vaccinium), spiraea (Spiraea), meadowsweet (Filipendula), purple loosetrife (Lythrum), cinquefoil (Potentilla), wild rose (Rosa), heather (Calluna), sea buckthorn (Hippophae) etc. 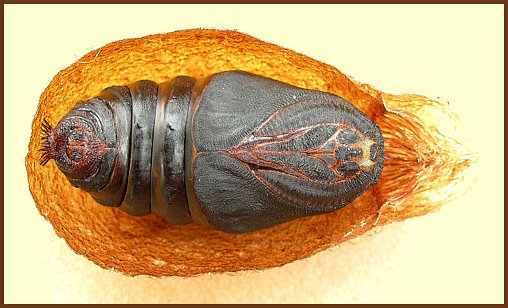 PUPA: 20--25mm. Dark brown to black, noticeably dorso-ventrally flattened, and 'comma'-shaped. 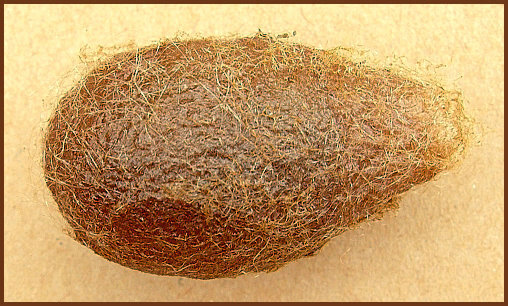 Formed in a coarse, thin-walled, pear-shaped, double, unsealed brown cocoon low down amongst the hostplant, often at ground-level. Tachinidae: Compsilura concinnata (Meigen), Epicampocera succincta (Meigen), Eurithia consobrina (Meigen), Exorista grandis (Zetterstedt), Exorista sorbillans (Wiedemann), Huebneria affinis (Fallén), Linnaemyia comta (Fallén), Masicera pavoniae (Robineau-Desvoidy), Masicera silvatica (Fallén), Phryxe nemea, Phryxe vulgaris (Fallén), Rhacodinella apicata, Winthemia quadripustulata (Fabricius), Winthemia variegata (Meigen); Braconidae: Meteorus luridus Ruthe, Microplitis aduncus Ruthe, Proapanteles immunis (Haliday); Ichneumonidae: Agrothereutes fumipennis (Gravenhorst), Agrothereutes incubitor Strom, Agrothereutes tibialis Thomson, Amblyteles armatorius (Forster), Amblyteles oratorius (Fabricius), Anomalon signatum Gravenhorst, Exetastes illusor (Gravenhorst), Exetastes nigripes (Gravenhorst), Gelis insolens (Gravenhorst), Gelis palpator (Gravenhorst), Metopius dentatus (Fabricius); Trichogrammatidae: Trichogramma telengai. The most widely distributed palaearctic saturnid, ranging in the west from Ireland across the Ural Mountains (Nupponen & Fibiger, 2002) to Siberia, and from northern Scandinavia and arctic Russia south to northern Spain, the northern Alps, Slovakia, Kazakhstan and the Caucasus; recorded from as far north as Arkhangelsk Oblast in european Russia (Kozlov, Kullberg & Zverev, 2014). A rarity in the Republic of Georgia and Armenia (Zolotuhin, Didmanidze & Petrov, 2011). Extra-limital range. The Altai Mountains, central and southern Siberia, southern Yakutia (Kaimuk et al., 2005), the Russian Far East (Izerskiy, 1999a; Dubatolov, 2009; Dubatolov & Dolgikh, 2009) and northeast China.